The Gustavus women's hockey team survived a close one-goal game to Wisconsin-River Falls by the score of 1-0 Wednesday evening on Don Roberts Ice Rink. Andrea Peterson scored the game-winning goal in the second period and Gustavus goaltender Sarah Windhorst shut out the Falcons for the victory. Gustavus improves to 8-1-0 overall, while UW-River Falls drops to 7-2-3 this year. Gustavus Adolphus sophomore wide receiver Chad Arlt (St. Michael, Minn.) has been named to the 2006 D3football.com All-West Region Third Team Offense. The All-Region Team, selected in balloting by West Region sports information directors and D3football.com staff, was chosen from 159 nominations by member schools with a total of 76 players chosen. The Gustavus Adolphus Nordic skiing team opened their 2006-07 season last weekend at the Grand View Cross Country Ski Challenge in Ironwood, Mich. Kathleen DeWahl led the Gustie women with an 11th place finish in the women's open division of Saturday's 1K freestyle sprint and a 17th place finish in Sunday's 5K classical race. Elias Anoszko led the Gustie men with a 12th place finish in the Olympic Juniors division of Saturday's sprint, while Scott Kyser finished 55th in Sunday's 10K classical race. 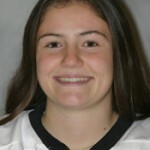 Gustavus Adolphus senior Kelly Crandall has been named Minnesota Intercollegiate Athletic Conference Women's Hockey Player of the Week for the week ending Dec. 10, 2006. 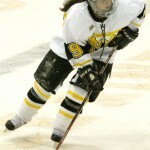 Crandall, a forward, scored five goals and an assist to lead the third-ranked Gusties to a weekend sweep over Saint Mary's. The weekend was highlighted by Crandall's second career collegiate hat trick on Friday. The Gustavus men's basketball team defeated University of Minnesota-Morris 91-58 on Monday evening in a non-conference matchup in St. Peter. The Gusties utilized a 13-0 run in the first half to take a 49-33 lead into halftime and then used several big runs in the second half en route to a 33-point victory. Gustavus improves to 5-3 overall while the Cougars fall to 1-8 on the season. Kelly Crandall scored a pair of goals and an assist Saturday to complete a six-point weekend and lead the Gustavus Adolphus women's hockey team to a 5-1 victory over Saint Mary's in Winona. The Gusties (#3 USCHO.com) take a 7-1-0 overall record into a top-ten showdown with 6-1-3 UW-River Falls (#10 USCHO.com) Wednesday in St. Peter. The Gustavus men's hockey team completed a two-game sweep of St. Mary's by shutting out the Cardinals 2-0 at Don Roberts Ice Rink. Tim Ornell (Jr., Lino Lakes, Minn.) and Eric Bigham (Fy., Robbinsdale, Minn.) each had a goal in the game and each assisted on the other's goal. The Gusties improve to 6-6-1 overall and a perfect 6-0-0 in the MIAC. St. Mary's falls to 3-7-1 overall and 1-4-1 in the conference. The Gustavus Adolphus Nordic ski team will open its season this weekend at the Grand View Cross Country Ski Challenge at Wolverine Nordic Ski Club near Ironwood, Mich. Saturday's action will feature a 1-kilometer freestyle sprint at nearby Big Powderhorn Mountain, while Sunday's races will feature a 5-kilometer women's classic race and a 10-kilometer men's classic race, both at Wolverine Ski Trail. The Gustavus women's hockey team shutout St. Mary's 4-0 on Don Roberts Ice Rink to claim its sixth consecutive win. Kelly Crandall (Sr., Plymouth, Minn.) led the Gusties with three goals and Stefanie Ubl (Jr., Blaine, Minn.) recorded her third goal of the season. Gustavus improves 6-1-0 overall and 5-0-0 in the MIAC. The Cardinals fall to 2-5-2 overall and 2-2-1 in the MIAC. The Gustavus men's hockey team improved to 5-0-0 in MIAC play with a thrilling 2-1 overtime win against St. Mary's in Winona on Friday night. 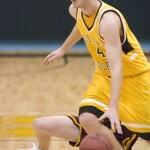 Gustie senior Mike Hosfield scored the game-winner just :47 seconds into the overtime. The two teams will play again on Saturday night in St. Peter at 7:05 pm.